Well, the Easter Bunny may be hopping down the bunny trail, but all our marketing buddies have been busily hopping down the blogging trail - dishing up lots of fabulous posts to inspire and educate. Here are our favorite picks of the week. Hope you enjoy them & that the Easter Bunny brings you some awesome eggs. This overview of the importance of content marketing to the compex sales process includes insights from a new Mediative white paper and examples from SAP and Amex's Open. Great overview of how to get started with content marketing ... the right way. Not sure what to write about on your corporate blog? Afraid of putting me-too content out there? Check these tips to help keep your content fresh and unique. You're not doing this to your customer. Are you? Tell me you're not. Solid tips on how to make your content work harder. If your blog isn't attracting an audience, you might want to check these three points to make sure you're not making an obvious mistake. I found myself going to and bookmarking a lot of the posts referenced in this handy list from KISSmetrics. If you are a blogger looking to streamline your process, check out this post from Stanford Smith. Heidi Cohen shares some ideas on how to keep writer’s block at bay. Do you have a press room on your website? If not, you should. Here are some tips to get started or improve what you have. Find out what gets under the skin of CMOs so you can stay on your CMO's good side. Eric Wittlake plays devil's advocate and sparks an interesting discussion -- check out the comments. For most people, it will take years before they find their dream job. This means changing of jobs, as well as non-transferable skills. When you choose the professional resume writing service, you are guaranteed to get a resume\CV written by a professional writer. Each writer is educated, talented, and has the necessary experience. Thanks for sharing savvy week review with us. I love Easter Bunny. And at our office Quality Dissertation - http://www.qualitydissertation.co.uk celebrating Easter Sunday at office by making yummy Easter bunny cake for the students who are taking dissertation help from the us and also arranging party and enjoying along with the family members. 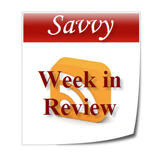 Its really very nice blog about savvy week review. Since I am Australian assignment help service provider at secure assignment help - http://www.secureassignmenthelp.com/ and I would like to share this with my academic team and students, also recommend to more people. Thanks fr sharing keep it up !! and sharing with us. Hello Easter Bunny, I have seen your fantastic post. Your post provides a Some techniques for marketing. I appreciate your hard work here and your efforts to help people. Savvy is the one of the best company for commercialization. I will suggest you go through the Bing Ads Coupons https://www.promoocodes.com/coupons/bingads/ and I use Bing Ads promo codes and save money you can also use coupons and save maximum money. Microsoft edge is the best browser it remember the password for your further use and save hour time to login further, you can see the password too if you forget that and in a single click you can login too.This is a very big advantage for us we can save our time and work faster then before. Thanks for sharing a post. It is really nice.I was extremely satisfied to discover this site. All things considered, the Easter Bunny might jump down the bunny trail, yet all our advertising mates have been hectically bouncing down the blogging trail - dishing up loads of fantastic presents on move and instruct. Here are our most loved picks of the week. There’s Amazing Marketing article Content. Awesome information is there in this post. Please post like this articles more. nice post very interesting post and users have nice experience by reading these posts. Well nice post! I have collect much information on it keep posting here. Awesome article specially the quality of content on your website. View this site http://www.dissertationtigers.com/ as the data available information. John arnold is an academic writer of the Dissertation-Guidance. <a href="http://rprogramminghelp.com/">Do My R Programming Homework</a> Who writes quality academic papers for students to help them in accomplishing their goals.